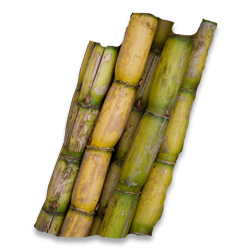 Sugarcane grows best in the tropical regions, receiving a rainfall of 750-1200 mm. 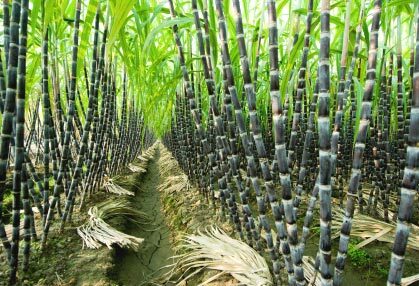 Sugarcane grows well on medium heavy soils and heavy clays, provided there is adequate irrigation. The soils should be well drained. The normal planting season is October-December. Delay in planting reduces cane yield. Planting should not be delayed beyond February in the plains. In hilly tracts where sugarcane is cultivated under rainfed conditions, planting should be done after abatement of heavy rains. Select top ends of mature, healthy disease free canes up to 1/3 of total length and cut into setts of three eye buds. The seed rate is 40000-45000 setts/ha. For control of fungus diseases like red rot, dip cut ends of setts in 0.25% solution of copper based fungicides. Plough the land thrice length wise and breadth wise and level properly. Prepare furrows 25cm deep and 75 cm apart for short duration and 90cm apart for medium duration varieties. In hilly tracts, prepare pits in rows along the contour at spacing of 30 cm in the row and 75 cm between the rows. For mid-late varieties, an inter-row spacing of 75 cm is recommended. Plant setts end to end in the furrow, with the eye buds facing sideways and cover with soil. In the pit system, plant 2-3 setts in each pit. Apply compost or cattle manure, 10t/ha or pressmud 5t/ha or dolomite 500kg/ha or calcium carbonate 750 kg/ha. In addition, the following fertilizers as N: P2O5:K2O kg/ha are also recommended. Apply organic manures such as compost/cattle manure/pressmud as basal dose preferably in furrows and mix well with soil before planting. In sugarcane tracts of Palakkad where sett treatment with Azospirillum @ 500 g/ha together with soil application 5kg/ha is done, sugarcane need be given only 175 kg N/ha. Apply lime/dolomite/calcium carbonate in the field before final preparation of the land. Apply N and K2O in two splits, the first 45 days after planting and the second 90 days after planting along with earthing up. Do not apply N beyond 100 days after planting. Apply entire dose of phosphorous as basal dressing. When pressmud at 10t/ha is applied sugarcane grown in Palakkad need be given only 50% of the recommended dose of P as rock phosphate. When ratoon crop of sugarcane is trash mulched @ 4t/ha the crop must be given only 100% of the recommended dose of NPK 225:75:75 against the existing recommendation of 125%. The crop should be weeded twice on 45 and 90 days after planting before application of fertilizers. First weeding is done by digging on the ridges and by hand in the furrows. Care should be taken to see that the furrows are not filled up while digging so that tillering is not affected. At the time of second digging, the crop is partially earthed up to arrest formation of late shoots. With the commencement of the southwest monsoon, final earthing up should be done to prevent lodging. At this time, detrashing is to be done to prevent the possible germination of axillary buds and to reduce pest infestation. Prevent lodging either by twisting of trash or by propping. Apply oxyflurofen at 0.61 kg ai/ha as pre emergent and at 60 days after planting as post emergent application. Under irrigated conditions, intercropping with short duration pulse crop is recommended. In such cases, sow the pulse crop on the ridges one month in advance, so that the first intercultivation is not hindered. As a green manure, sunnhemp can also be raised on the ridges. Irrigate the crop 8-10 times depending upon the availability of rains. In Chitoor area, more number of irrigations will be necessary. In early growth periods, irrigate the crop at more frequent intervals. However, avoid too much moisture and water stagnation especially during germination and early growth phases. Alternate furrow with trash mulching could economise the use of irrigation water to the tune of 41% during the formative phase of spring planted sugarcane as compared to all furrow irrigation with trash mulching. 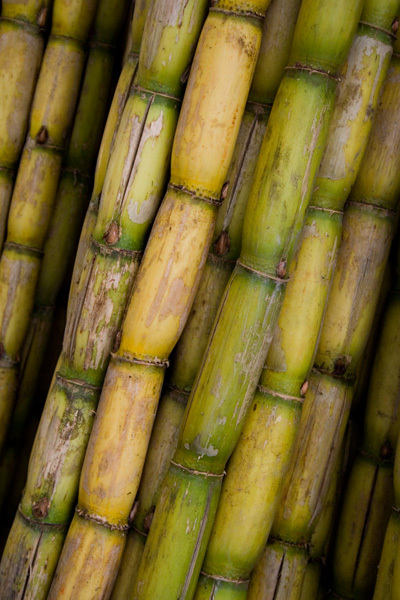 The most important pests of sugarcane found in the state are early shoot borers, top shoot borers, mealy bugs, white grubs, termites and rats. Affected crop should be harvested as early as possible to prevent loss in yield and deterioration in quality and also to arrest further spread of the disease. The crop residues should be completely burnt after harvesting. When infection is noticed in the field, the affected clumbs should be uprooted and burnt promptly. Infected crop should never be ratooned. Water should not be let into a healthy crop from diseased areas and as far as possible, the field may kept free of standing water by providing drainage channels. Seed setts should not be collected from diseased crops and from diseased areas. Movement of seed materials from diseased to healthy areas should be strictly quarantined. Cultivate red rot resistant varieties. Other transmissible diseases like grassy shoot, ratoon stunting, etc. can be controlled by heat treatment and by implementing three tier seed programme. Harvest the crop when it is fully mature. Delayed harvesting will reduce yield and recovery percentage. Normally not more than two ratoon crops are recommended. Burn the trash after spreading uniformly in the area immediately after the harvest of the previous crop. Stubble shaving should be done with a sharp spade wherever the canes are not cut close to the ground. Fill the gaps at the rate of one-three budded sett for every 50 cm gap. Polybag settlings are produced by planting single budded setts in polythene covers containing potting mixture and transplanted at 45-60 DAP. Ratoon crop requires a higher dose of nitrogen than plant crop. An extra dose of 25% nitrogen is recommended. Manure the crop by 25th and 75th days after harvest of the previous crop. Entire quantity of phosphorous, half of nitrogen and potash are applied as the first dose and the remaining as the second dose. The first dose is incorporated into the soil by digging and the second dose is applied around the clump and earthing up is done. Weeding is also done at this time. Irrigation is given as in plant crop.